While Black Chasm Cavern was likely known about by the local Miwok people who existed in this area long before the gold rush, the first documented exploration occurred in 1854 when a group of explorers braved the unknown to discover the phenomenal beauty that exists below the surface including a bright blue lake and millions of sparkling crystals that seemed to twist from the cavern walls in every direction, we now know these unusual formations as 'helictites. Simple tours were held at Black Chasm in those early days, barely penetrating the cavern system that we know today. Shortly afterwards, with the decline of the gold rush, Black Chasm was abandoned and largely forgotten about except for by a handful of speleologists that continued to explore the chasm and discover the seemingly endless beauty of the cavern. 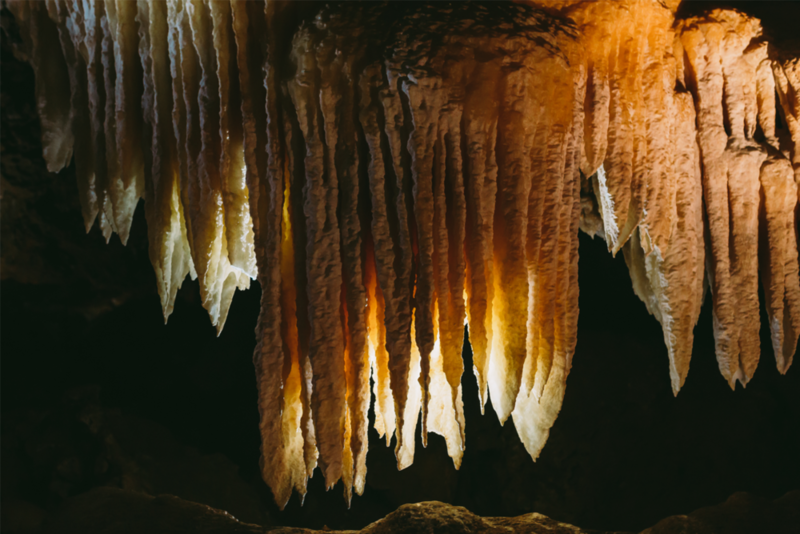 Over 100 years after its discovery Black Chasm was recognized by the federal government for the abundance of the unusual and rare speleothems called “helictites” that grow throughout the cavern and declared a National Natural Landmark in 1976. Twenty years later Black Chasm began to be developed as a show cave with the construction of environmentally friendly steps and walkways Today guests can explore the cavern via these platforms and view the dazzling array of crystals throughout the cave guided by an experienced and knowledgeable cavern naturalist. While Black Chasm contains an incredible variety of speleothems the highlight of the cavern is the incredible displays of helictite formations. While most cave visitors are familiar with “stalactites” and “stalagmites”, Black Chasm is decorated with these as well as millions of “helictite” formations. These amazing crystals seem to defy gravity as they twist and curl from the cave wall in every direction. Of all known caves on Earth, perhaps 5% contain helictites. Inside Black Chasm, helictites grow in each and every chamber and in such an abundance that Black Chasm was declared a National Natural Landmark in 1976 in recognition of this spectacular example of America's natural history. On the walking tour, guests will view hundreds of thousands of helictites including many that twist into shapes that are reminiscent of different animals and figures including candy canes, butterflies, reindeer and a dragon that has been adopted as the cave mascot. In addition to the amazing Black Chasm Cavern, guests may be able to visit the Zen Garden located on the property. This area is not only naturally beautiful but also historically significant. During the Gold Rush, Hydraulic mining was used extensively in the Volcano area. This resulted in millions of tons of top-soil being washed away into Sutter Creek and beyond. What resulted was an area of convoluted marble monoliths that was uncovered during these operations. A self-guided walking tour is available through this remarkable area when the Zen Garden is open to visitors. Due the ecologically fragile nature of the Zen Garden, we may choose to close access as certain points throughout the year. Speak to a naturalist at the visitor center for directions and a pamphlet to guide you through the garden.